For the band, see M.I.R.V. The MIRV U.S. Peacekeeper missile, with the reentry vehicles highlighted in red. Technicians secure a number of Mk21 reentry vehicles on a Peacekeeper MIRV bus. LGM-118A Peacekeeper MIRV at the National Museum of the United States Air Force. A Trident II missile, operated exclusively by the US Navy and Royal Navy. Each missile can carry up to 14 warheads. A multiple independently targetable reentry vehicle (MIRV) is a missile payload containing several warheads, each capable of being aimed to hit a different target. The concept is almost invariably associated with intercontinental ballistic missiles carrying thermonuclear warheads, even if not strictly being limited to them. By contrast, a unitary warhead is a single warhead on a single missile. An intermediate case is the multiple reentry vehicle (MRV) missile which carries several warheads which are dispersed but not individually aimed. Only China, France, Russian Federation and United States are currently confirmed to possess functional MIRV missile systems. India, Israel and Pakistan are known or suspected to be developing or possessing MIRVs. The first true MIRV design was the Minuteman III, first successfully tested in 1968 and introduced into actual use in 1970. The Minuteman III held three smaller W62 warheads of about 170 kilotons each in place of the single 1.2 megaton W56 used in the earlier versions of this missile. From 1970-1975, the United States would remove approximately 550 earlier versions of the Minuteman ICBM in the Strategic Air Command's (SAC) arsenal and replace them with the new Minuteman III's outfitted with a MIRV payload, increasing their overall effectiveness. The smaller power of the warhead was offset by increasing the accuracy of the system, allowing it to attack the same hard targets as the larger, less accurate, W56. 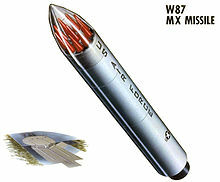 The MMIII was introduced specifically to address the Soviet construction of an anti-ballistic missile (ABM) system around Moscow; MIRV allowed the US to overwhelm any conceivable ABM system without increasing the size of their own missile fleet. The Soviets responded by adding MIRV to their R-36 design, first with three warheads in 1975, and eventually up to ten in later versions. While the United States phased out the use of MIRVs in 2014 to comply with New START, Russia continues to develop new missile designs using the technology. The introduction of MIRV led to a major change in the strategic balance. Previously, with one warhead per missile, it was conceivable that one could build a defense that used missiles to attack individual warheads. Any increase in missile fleet by the enemy could be countered by a similar increase in interceptors. With MIRV, a single new enemy missile meant that multiple interceptors would have to be built, meaning that it was much less expensive to increase the attack than the defense. This cost-exchange ratio was so heavily biased towards the attacker that the concept of mutual assured destruction became the leading concept in strategic planning and ABM systems were severely limited in the 1972 Anti-Ballistic Missile Treaty in order to avoid a massive arms race. Enhance first-strike proficiency for strategic forces. Providing greater target damage for a given thermonuclear weapon payload. Several small and lower yield warheads cause much more target damage area than a single warhead alone. This in turn reduces the number of missiles and launch facilities required for a given destruction level - much the same as the purpose of a cluster munition. With single warhead missiles, one missile must be launched for each target. By contrast, with a MIRV warhead the post-boost (or bus) stage can dispense the warheads against multiple targets across a broad area. Reduces the effectiveness of an anti-ballistic missile system that relies on intercepting individual warheads. While a MIRV attacking missile can have multiple warheads (3–12 on United States and Russian missiles, or 14 in a maximum payload shorter-range configuration of the Trident II now barred by START), interceptors may have only one warhead per missile. Thus, in both a military and an economic sense, MIRVs render ABM systems less effective, as the costs of maintaining a workable defense against MIRVs would greatly increase, requiring multiple defensive missiles for each offensive one. Decoy reentry vehicles can be used alongside actual warheads to minimize the chances of the actual warheads being intercepted before they reach their targets. A system that destroys the missile earlier in its trajectory (before MIRV separation) is not affected by this but is more difficult, and thus more expensive to implement. MIRV land-based ICBMs were considered destabilizing because they tended to put a premium on striking first. The world's first MIRV—US Minuteman III missile of 1970—threatened to rapidly increase the US's deployable nuclear arsenal and thus the possibility that it would have enough bombs to destroy virtually all of the Soviet Union's nuclear weapons and negate any significant retaliation. Later on the US feared the Soviet's MIRVs because Soviet missiles had a greater throw-weight and could thus put more warheads on each missile than the US could. For example, the US MIRVs might have increased their warhead per missile count by a factor of 6 while the Soviets increased theirs by a factor of 10. Furthermore, the US had a much smaller proportion of its nuclear arsenal in ICBMs than the Soviets. Bombers could not be outfitted with MIRVs so their capacity would not be multiplied. Thus the US did not seem to have as much potential for MIRV usage as the Soviets. 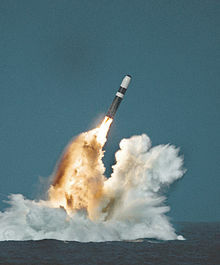 However, the US had a larger number of Submarine-launched ballistic missiles, which could be outfitted with MIRVs, and helped offset the ICBM disadvantage. It is because of their first-strike capability that land-based MIRVs were banned under the START II agreement. START II was ratified by the Russian Duma on 14 April 2000, but Russia withdrew from the treaty in 2002 after the US withdrew from the ABM treaty. In a MIRV, the main rocket motor (or booster) pushes a "bus" (see illustration) into a free-flight suborbital ballistic flight path. After the boost phase the bus maneuvers using small on-board rocket motors and a computerised inertial guidance system. It takes up a ballistic trajectory that will deliver a reentry vehicle containing a warhead to a target, and then releases a warhead on that trajectory. It then maneuvers to a different trajectory, releasing another warhead, and repeats the process for all warheads. Minuteman III MIRV launch sequence: 1. The missile launches out of its silo by firing its first-stage boost motor (A). 2. About 60 seconds after launch, the 1st stage drops off and the second-stage motor (B) ignites. The missile shroud (E) is ejected. 3. About 120 seconds after launch, the third-stage motor (C) ignites and separates from the 2nd stage. 4. About 180 seconds after launch, third-stage thrust terminates and the post-boost vehicle (D) separates from the rocket. 5. The post-boost vehicle maneuvers itself and prepares for reentry vehicle (RV) deployment. 6. While the post-boost vehicle backs away, the RVs, decoys, and chaff are deployed (this may occur during ascent). 7. The RVs and chaff reenter the atmosphere at high speeds and are armed in flight. 8. The nuclear warheads detonate, either as air bursts or ground bursts. The precise technical details are closely guarded military secrets, to hinder any development of enemy counter-measures. The bus's on-board propellant limits the distances between targets of individual warheads to perhaps a few hundred kilometers. Some warheads may use small hypersonic airfoils during the descent to gain additional cross-range distance. Additionally, some buses (e.g. the British Chevaline system) can release decoys to confuse interception devices and radars, such as aluminized balloons or electronic noisemakers. 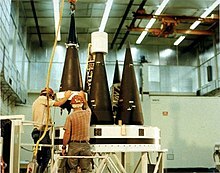 Testing of the Peacekeeper reentry vehicles: all eight (of a possible ten) were fired from only one missile. 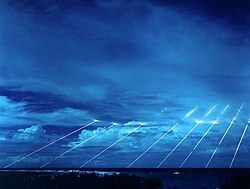 Each line shows the path of an individual warhead captured on reentry via long-exposure photography. Accuracy is crucial, because doubling the accuracy decreases the needed warhead energy by a factor of four for radiation damage and by a factor of eight for blast damage. Navigation system accuracy and the available geophysical information limits the warhead target accuracy. Some writers believe[weasel words] that government-supported geophysical mapping initiatives and ocean satellite altitude systems such as Seasat may have a covert purpose to map mass concentrations and determine local gravity anomalies, in order to improve accuracies of ballistic missiles. Accuracy is expressed as circular error probable (CEP). This is simply the radius of the circle that the warhead has a 50 percent chance of falling into when aimed at the center. CEP is about 90–100 m for the Trident II and Peacekeeper missiles. A multiple reentry vehicle payload for a ballistic missile deploys multiple warheads, also known as "bomblets", in a "shotgun" like pattern above a single target (as opposed to multiple independently targetable reentry vehicle, which deploys multiple warheads against multiple targets). The advantage of an MRV over a single warhead is the increased effectiveness due to the greater coverage, this increases the overall-damage produced within the center of the pattern making it far greater than the damage possible from any single warhead in the MRV cluster; this makes for an efficient area attack weapon and makes interception by anti-ballistic missiles unlikely due to the number of warheads being deployed at once. Improved warhead designs allow smaller warheads for a given yield, while better electronics and guidance systems allow greater accuracy. As a result, MIRV technology has proven more attractive than MRV for advanced nations. Multiple-warhead missiles require both a miniaturised physics package and a lower mass reentry vehicle, both of which are highly advanced technologies. As a result, single warhead missiles are more attractive for nations with less advanced or less productive nuclear technology. The United States first began development of an MRV payload which was first used on the Polaris A-3 SLBM and was first deployed for use in 1964 on the USS Daniel Webster. The Polaris A-3 carried 3 "bomblets" each having an approximate yield of 200 Kt. The Royal Navy also had MRV payloads with the Chevaline upgrade. The Soviet Union deployed MRVs on the R-36 Mod 4 ICBM. Refer to atmospheric reentry for more details. ^ Parsch, Andreas. "UGM-133". Directory of U.S. Military Rockets and Missiles. Retrieved 2014-06-13. ^ a b c d Polmar, Norman. (2009). The U.S. nuclear arsenal : a history of weapons and delivery systems since 1945. Norris, Robert S. (Robert Stan). Annapolis, Md. : Naval Institute Press. ISBN 9781557506818. OCLC 262888426. ^ "Last Malmstrom ICBM reconfigured under treaty". Great Falls Tribune. Retrieved 2018-09-08. ^ "Putin has touted an 'invincible' nuclear weapon that really exists — here's how it works and why it deeply worries experts". Business Insider. Retrieved 2018-09-08. ^ "Multiple Independently Targetable Reentry Vehicles (MIRVs)". Retrieved 14 June 2014. ^ Robert C. Aldridge (1983). First Strike! : The Pentagon's Strategy for Nuclear War. South End Press. pp. 65–. ISBN 978-0-89608-154-3. Retrieved 26 February 2013. ^ Cimbala, Stephen J. (2010). Military Persuasion: Deterrence and Provocation in Crisis and War. Penn State Press. p. 86. ISBN 978-0-271-04126-1. Retrieved 3 May 2013. ^ "No intention to cap missile plan". Business Standard. Retrieved 17 March 2019. ^ "Agni-V with China in range tested; next in line is Agni-VI, with multiple warheads". TOI. 27 December 2016. Retrieved 17 March 2019. ^ a b "Arms Control and Proliferation Profile: India". January 2018. Retrieved 17 March 2019. ^ "Iran Defies Donald Trump as it Test-Fires Khoramshahr Missile With Range 2000 km; Can Carry Several Types of Warheads". India News. September 23, 2017. ^ "Iran New Khorramshahr ballistic missile unveiled during military parade". Army Recognition. September 2017. ^ "Statement for the Record: Worldwide Threat Assessment". Defense Intelligence Agency. March 6, 2018. Wikimedia Commons has media related to MIRV. "MIRV: A BRIEF HISTORY OF MINUTEMAN and MULTIPLE REENTRY VEHICLES" by Daniel Buchonnet, Lawrence Livermore Laboratory, February 1976.